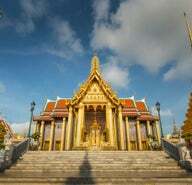 The splendid, much-coveted Thai temple (or wát) is actually a compound of different buildings that serve specific religious functions. 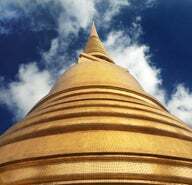 Even if you don’t consider yourself spiritual, Bangkok’s temples provide a multitude of pleasures that range in scope from artistic inspiration to more straightforward urban exploration. 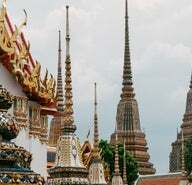 Within the temples themselves you’ll see the native Siamese styles of building, as well as examples from historical Khmer, Mon, Lao and northern Thai traditions. 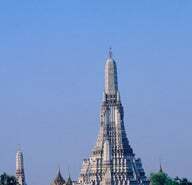 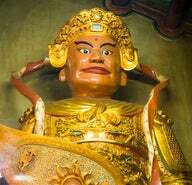 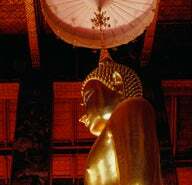 The observant will quickly note that every wát in Bangkok has a Buddha image, usually sculpted according to strict iconographical rules found in Buddhist art texts dating to the 3rd century AD. 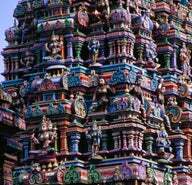 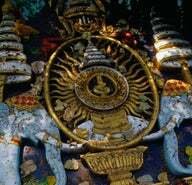 Myriad scenes from both secular and religious life embellish the inner walls of temples. 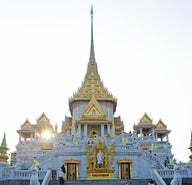 Always instructional in intent, painted images range from depictions of the jatakas (life stories of the Buddha) and scenes from the Indian Hindu epic Ramayana to elaborate scenes detailing daily life in Thailand.